4 APRIL 2018 MORE TIME, FEWER BOOKS? Good news from the latest Pew Survey on American reading habits: Americans are still reading books, and reading lots of them. Oddly, though, it seems that the older we get and the more time we have, the fewer books we read. We don’t read the way we used to read. In fact, the latest Pew Survey confirms that many people are reading books today without cracking open a book, or, more precisely, a bound, print book. Print books are far from dead: they are still far and away the most popular way to read books in America. 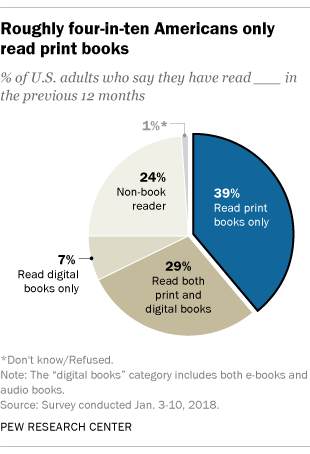 Nearly 70% of Americans reported reading at least one print book in the past year, and about four-in-ten restrict their reading to print books alone. On the other hand, nearly a quarter of Americans reported reading no books at all, print or otherwise. The typical American read four books last year according to the Pew Survey. Some people must be reading vastly more than others, since the survey found that, overall, Americans on average read 12 books last year. Exactly what books we’re reading is unclear. Pew did not ask about that. Still—Americans read books. 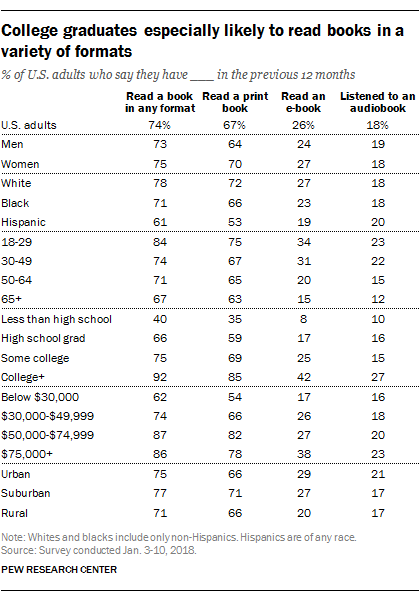 Just as my own far less scientific poll found, the new Pew Survey found we are also reading books in a variety of ways. Nearly one-in-five (18%) of U.S. adults listened to an audiobook in the past year, and over a quarter (26%) read an e-book. Both audiobooks and e-books were also most popular among people in the highest educational and income brackets, but so were print books. These numbers of Americans have stayed pretty consistent since Pew’s last survey in 2016 except for a small increase in audiobook readers. So have the percentage of Americans who say they do not read books at all. Many demographic patterns resembled those found since Pew first started this survey in 2011. College grads and people with higher incomes continued to be more likely to read books in any format, which is not a terribly big surprise. College graduates continued to be particularly likely to read books in a variety of formats. Women also continued to be more likely to read print books than men while men still had a slight edge in listening to audiobooks. There were some notable changes from 2016, however, including a near doubling in the percentage of high school grads who have listened to an audiobook in past year (9-16%) and a huge rise in the number of rural adults and younger adults listening to audiobooks. Age made some difference in preferred book format—but not a huge one. For example, 10% of 18-29-year-olds only read books in digital formats vs. 5% of ages 50-64 and 4% of those 65 and older. Most concerning is a steady decline in reading throughout the lifespan. While print books were the most popular way of reading for all age groups, younger adults (ages 18-29) were most likely to read books in any and all formats. This should be comforting to those who think reading books is going out of style. More puzzling is that a third of people ages 65 and older report reading no books whatsoever. In fact, there is a steady decline in reading throughout the lifespan for books overall, and for books in any format. That people read fewer books the older they get seems counterintuitive. You would think the 65-plus crowd would have the most time in their lives to read books. You would also think they have fewer distractions and longer attention spans. Perhaps declining vision and hearing make it harder to read books. But that does not explain why the older we get, the fewer books we read. Perhaps these changes in reading habits over the lifespan are just another example of time expanding to fill the work and its corollary: the more time you have, the less you get done. Or perhaps the younger generation is just plain more interested in books. If so, I suppose these findings provide a glimmer of hope for reading habits–though I might feel even better if I knew just what kinds of books this young book-hungry generation is reading.